By the author of The $100 Hamburger! TAKE OFF, TOUCH DOWN, TEE OFF! If you re a pilot who loves to golf, too, here s a book that lets you combine your passions and make the most of your time. The $500 Round of Golf lists the best places to land your plane for a quick round of golf, with every airstrip and golf course recommended by pilots for pilots. 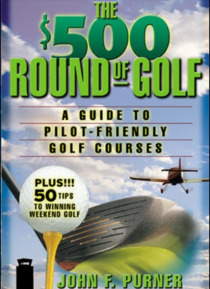 Written by a long-time aviator and golf… enthusiast, The $500 Round of Golf amuses, informs, and: * Includes runway information: service, location, etc. * Provides golf-course details: quality, style, price, transportation options, and operations * Covers the best places to land and golf in all 50 states * Reveals how flying to a round of golf offers a bigger, better tax write-off than lunch alone * Delivers 50 sure-fire tips to winning weekend golf * And much, much more So the next time you want to fly out and hit the links, hit this book first The $500 Round of Golf!